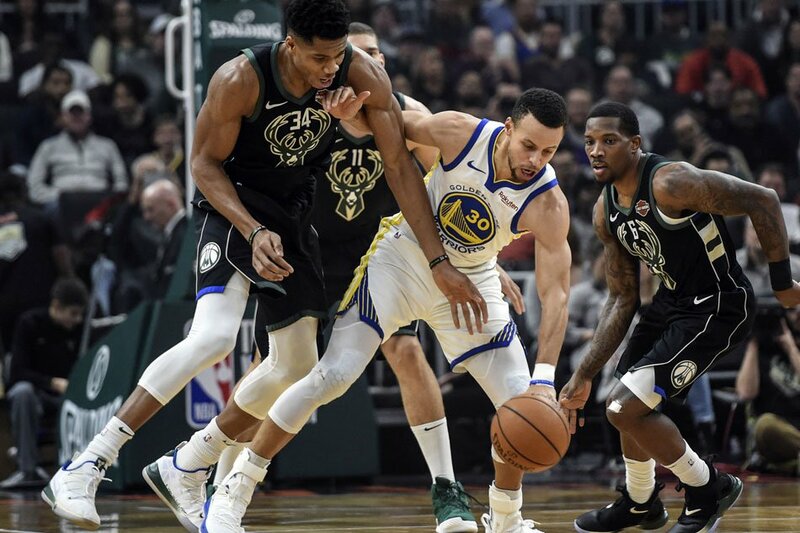 The Golden State Warriors made 19 three-pointers on Friday night and held their opponents, the Milwaukee Bucks, to just 95 points to win their third straight game on the road by a score of 105-95. The Warriors won every quarter of the game, using their sharp shooting from behind the arc and defensive acumen, to ‘teach’ the young Bucks a lesson in how to play against the big boys. And you want to know what is scary about the whole scenario for anyone that might have to play the Warriors? They did this without Draymond Green and Boogie Cousins, each of which should be set to play relatively soon. In Green, you have a perennial defensive player of the year on your hands. In Cousins, you have a dynamic big man that could take this team to the next level- a proposition akin to Revelation levels of fright. The win gives the Warriors revenge for a 134-111 win for the Bucks in Oakland earlier this season, which had to count for something. Giannis Antetokounmpo scored 22 points and grabbed a massive 15 rebounds, but his Bucks fell after Steph Curry and Klay Thompson scored 20 each and Andre Iguodala got 15 off his own. In college football news, a lot of talk has been going on this week since UCF were once again left out of the College Football Playoff. The #8 Knights have been on the campaign trail ever since in an effort to schedule a game with a bigger school so that they can improve their resume going forward. Some schools have laughed them off due to it being a no-win, but Florida Athletic Director Scott Stricklin has said he would be open to playing the Knights, as long as he got a three game series in which his Gators were the home team twice and went away once. This isn’t how scheduling is typically done for college football, which is done in home-and-home series, but given that the Knights are in such a predicament, they might have to seriously consider this offer so that they can have a real chance to show their worth and make the last four sometime in the near future, barring a format change. Stricklin also shot down accusations that he lobbied against playing UCF in a bowl game this year because his Gators had nothing to gain by playing the smaller school.